Popularly known as Kashmir FC, Lone Star Kashmir Football Club (LSFC) came to prominence in April 2015 when it defeated Hindustan FC in I-League division 2nd at Golaghat, Assam. The win triggered celebrations in Kashmir. The match was dubbed as India versus Kashmir contest on social media. The idea to open a professional football club in Kashmir was introduced in 2013. Iftikhar knew the challenges he had to face in achieving his goal and he was determined to overcome them. “It was a challenge as we required huge investment. We had to build the basic infrastructure. We are still facing challenges,” says Iftikhar. Iftikhar claims that the club had no commercial interests. The revenue generated is reinvested to develop the club. The aim of the club says Iftikhar, is to help the young generation to showcase their talent and raise the standard of the sport in Kashmir. 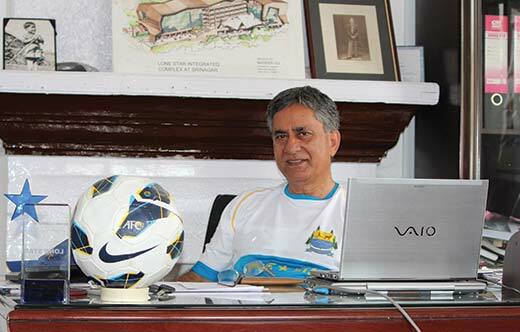 The club, affiliated with J&K Football Association, has many other challenges to deal with. For training, practice and other outdoor activities it uses sports grounds of J&K Sports Council, J&K Kashmir Football Association, college sports grounds and S P Higher Secondary School Ground. To get a proper single training and practice spot, the club is planning to renovate the sports ground of a private higher secondary school in Srinagar. The players who are enrolled with the club are paid salaries like football clubs outside Kashmir do. The club also helps the poor and underprivileged boys to pursue their education. There are a number of people associated with the club. Some are paid and some work voluntarily. Besides physical fitness football is known to help in overall development of a player. “The coaches at the club focus on inculcating moral values in students,” says Iftikhar. In order to have a smooth functioning of the club Iftikhar has hired people from outside the state who are well versed with the management of the sport. The reflection of achievements of the two year old club can be seen from the trophy cabinet inside the room at its office. There are trophies, medals, mementos, memorials. Last year the under-19 team of the club participated in a tournament in Jammu organized by JKFA. “We bagged runners up trophy.” This performance fetched the team a berth in U-19 I-league tournament played in New Delhi. Tafheem Tariq from U-19 team of the club made it to Pune FC, a highly reputed club of the India. “What else do we need,” says Iftikhar. But the real recognition that Iftikhar’s club got was after its senior team bagged runners up trophy during a 2nd Division I-league (a professional Indian football league for clubs) tournament in Guhati and Golaghat, Assam. Club is now looking forward to create an Under-15 team. Currently Kashmir FC’s senior team is participating in state level I-league tournament organized by JKFA. “We are hopeful that our team will do good,” says Iftikhar. Iftikhar feels the major reasons behind poor standard of football in Kashmir are; lack of knowledge among people associated with this game. The people in India and other countries know how and where to invest. Our infrastructure is poor. Our academies are not well equipped. He requests the business community to come forward and help small academies. He says that society should encourage the youth to play the sport. Good going Kashmir FC, we support u…. I am a football lover too from Ladakh….. Happy to see such a club from my state… All the best..